I am sure you are fed up seeing pumpkin recipes, but when I saw this cute little butternut squash in the supermarket, I couldn’t resist buying it. It’s been years that I wanted to make a pumpkin pie but never got around making it. I read a lot of pumpkin recipes on line and in the end I made something unique. 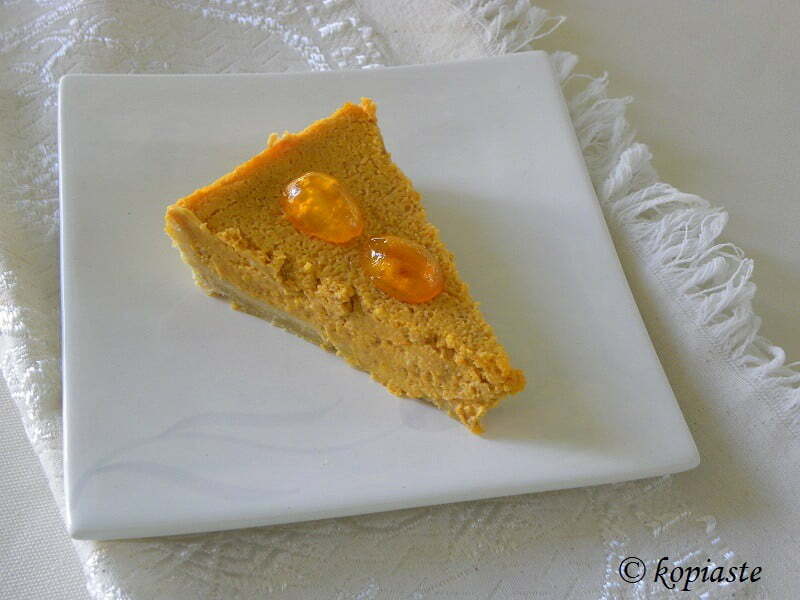 I made this delicious Pumpkin Cheesecake Tart, using Greek yoghurt, cream cheese and honey. The name pumpkin originated from the Greek word for “large melon” which is “pepon.” “Pepon” was changed by the French into “pompon.” The English termed it “pumpion” or “pompion.” If you would like to learn more about the origin of Pumpkin Pie, read more here. You all know that I am on a diet but how can I post a recipe if I do not have a personal view of the final result? My family told me that it was fantastic and everyone loved it but I wanted to have a personal view. I have never eaten Pumpkin Pie before so I had nothing to compare it with but I know a good flavour!! I don’t have a pie tart tin, so I just made it in a spring form baking tin. It may not look pretty but I assure you it tasted amazing!! I tried a small piece and it was creamy, moist and ever so subtly spicy but more sweet than what I would like. My children like desserts to be sweet but if I were to change something, that would be to add less brown sugar (maybe 1/2 cup) plus the honey in the filling. If you haven’t roasted pumpkin / butternut squash before it is really very easy. I’ve never tried canned pumpkin before, so I can’t compare, but making it yourself you can control what your family eats, without the preservatives and I am sure it costs much cheaper. If you have a baking dish with a lid, that would be perfect but if not just use an ordinary baking it and make sure to cover it tightly with aluminium foil, so that steam will not escape from it. Preheat the oven to 200o C/ 400o F.
Wash the pumpkin / butternut squash and cut it in the middle. Remove all the strings and seeds. Place it in a baking tin which will fit in the pumpkin. Add some water ( about 1 cup for up to 2 kilos). Bake for about 11/2 – 2 hours, depending on the size. Check to see if it is soft. When done, set aside until it can be handled and scoop out the pumpkin. Leave it in a colander until all the juices have drained before using. Place leftover in zip lock bags and store in the refrigerator up to 3 days or deep freeze for a longer period. Put all the pie crust ingredients in a large bowl. Cut the cold butter with a knife into small pieces or use a box grater and grate it on the side with large holes. Using you hand rub the butter with the flour until it is absorbed and then incorporate remaining ingredients till the mixture looks like coarse cornmeal. Finally add water, a tablespoon at a time, till flour is just moistened and holds together. Empty the dough in the baking tin and using your fingers or a mini rolling pin, spread in on the base and sides of the tart pan or baking tin. Cover the dough with parchment paper and fill with baking beans. Bake in a preheated oven to 180o C/ 350 o F, for about 25 – 30 minutes. Scoop out the pumpkin meat into a food processor and puree. Add yoghurt, cream cheese and honey and mix to incorporate. If the pumpkin puree is still hot, add it, a little at a time while continuing to whisk. Finally add spices and corn flour and mix. Remove parchment paper with weight from tart and empty the pumpkin mixture. Bake to 180o C/ 350 o F for about 45 – 50 minutes, checking from half an hour onward, until the filling is set. Set aside to cool and refrigerate before serving. Note: I decorated it with candied kumquats. Finally, as nothing goes wasted, while preheating the oven to roast the pumpkin, I roasted the pumpkin seeds as well. This procedure is a little time consuming but if you like pumpkin seeds, they are worth the little extra time spent. No extra energy consuming is necessary, as after the preheating time, I place the baking tin on top of the tupperware ultra casserole used to roast the pumpkin. After 15 minutes, I check it regularly so as not to burn. Remove all the strings from the seeds. Put them in a bowl with water and rub them with your fingers so that the strings detach from the seed. Remove whatever strings detach. Put them in strainer over running water and remove any remaining strings. Don’t worry if some of the orange fibers remain on the seeds. Leave them in the strainer to dry. Place them in a baking tin, season with coarse sea salt and spices and mix. I am linking this recipe to the ‘Abbecedario Culinario Mondiale an event organized by Trattoria MuVarA where we will be visiting 27 countries around the globe, going alphabetically. Volume 2, includes Breads, bread products, Pies, Snacks and a lot of Desserts. 1. Follow Kopiaste by subscribing to this blog (at the end of each post there is a SHARE/SAVE Blue button, where you can do this). If you’re on Facebook, ‘Like‘ Kopiaste.. to Greek Hospitality. 4. Last, leave a comment here on the post to let me know what you did. Your comment also counts as one entry. Wonderful recipe, as surely they will be all the other recipes of your beautiful books. I’ll show you lots of compliments.A hug to soon. That tart must be divine! I love your take on that classic. The cheesecake tart looks lovely! Good morning! I have uploaded the relevant link of your book, on an article in http://www.handbag.gr. I do not wish to win the book for myself, yet it would be nice if it would be offered to any of the site’s readers all over the world! I have to admit your blog/site is one of my favourite recipes reference! Kali evdomada! Gorgeous, perfect pie and like none I’ve ever made! Love it! And love the giveaway! I’d love your ebook! Your recipes are always divine and mouthwatering! Jamie, at the end of each post there is a SHARE/SAVE Blue button. I’m not at all fed up with pumpkin desserts–love them! This sounds delicious with the yogurt and honey. Ivy, your e-cookbooks look fabulous. What a beautiful photo on the cover. I’m following you on Facebook and still don’t really understand how to follow your updates by email but I’ll get there. What a stunning recipe for that cheesecake – love the decor of that candied kumquat. Great idea! Ivy, your pumpkin cheesecake looks delicious, such a light texture. I will mkw this for Christmas party. I watched your phylo video. I’m thinking that will be my appetizers.